I love God and His people; starting with Yvette, my wife since '77, our family, congregation, community, state, nation, and continuing around the world. 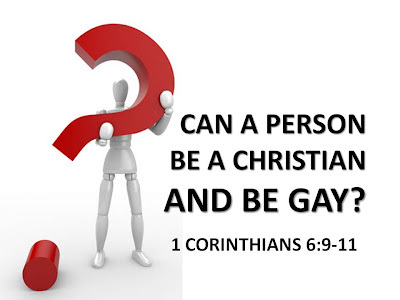 CAN A PERSON BE GAY AND BE A CHRISTIAN ? Today I will not be doing a gay bashing sermon nor delivering some sort of homophobic diatribe. What I do hope to do is to speak the truth in love - about sin - from the pages of the New Testament.